Cartoon lines seem to be dominating the specialty market these days. 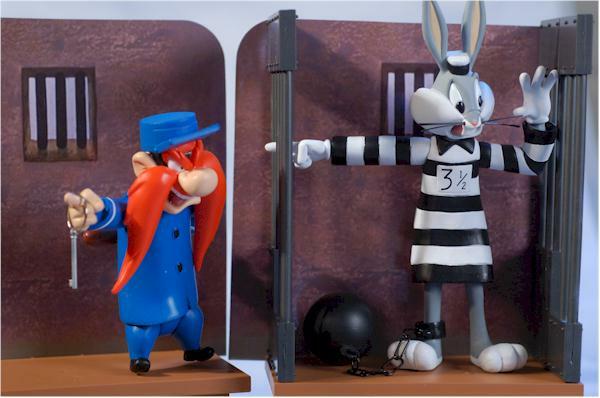 With South Park and Family Guy still cranking along from Mezco, Simpsons and Hanna-Barbera from Mcfarlane, and the Looney Tunes series from DC Direct, there's no shortage of animated characters to choose from. The third series of Looney Tunes was actually released at least a month ago, and I've been meaning to get around to the review all this time. It's just that other stuff kept leaping in front of them in the priority list, leaving poor Bugs in the dust. Well, it's time to get this review out there, particularly since this is a line that seems to be improving with each release. 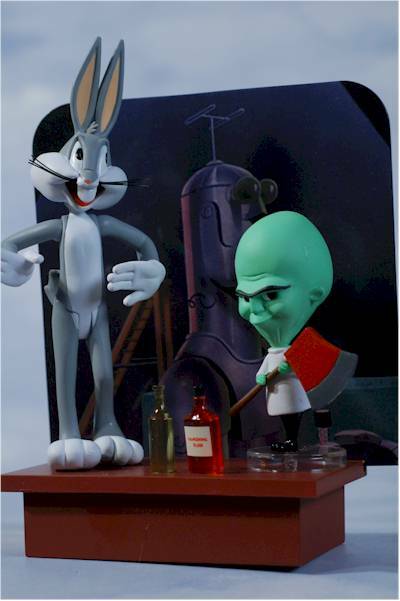 Series 3 consists of Bugs Bunny and his arch-nemesis Yosemite Sam from the short "Big House Bunny", and another Bugs Bunny along with the mad scientist and Gossamer (the big red hairball) from "Water, Water EveryHare". Yes, this wave, and in fact the entire series, is getting a little Bugs heavy at this point, with 4 of the six sets now involving Bugs. 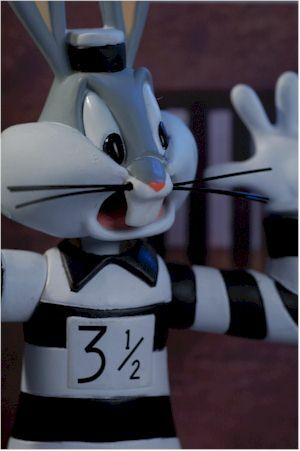 However, that also just translates to four of a total 13 figures as Bugs, not nearly as bad when you consider it that way. Along with Bugs we've gotten Daffy, Sylvester, Elmer, Wile E Coyote, the Roadrunner, and the Gashouse Gorilla. 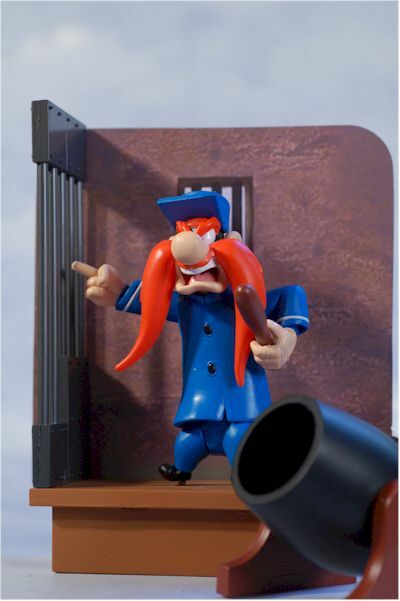 The addition of Yosemite Sam, the mad doctor, and Gossamer all are solid choices. However, I am hoping we see at least one of the next pair, perhaps both, not involving Bugs. Characters like Foghorn Leghorn, Pepe Lepew, the Tasmanian Devil, Speedy Gonzales, or Porky Pig, who had little or no interaction with Bugs, shouldn't be ignored. While the orders for the third series exceeded the allotments from Diamond, a good sign in terms of demand, we still haven't seen any plans for wave 4, which makes me a bit nervous. Comic shops got these in a few weeks ago, and you can expect to pay around $13 - $14 each. I have some suggestions on where to buy at the end of the review as well. Of all the DC Direct packaging, the work they've done on this series is my favorite. Each has a blurb on the back about the specific character and the episode that he's based on, along with information about accessories and some great graphics. The figures are well displayed in the package, and my only grip is that they're tough to store for the MOCer. They're actually pretty collector friendly too, although there's a few twisties that you wouldn't want to replace, and the Gossamer top flap is actually glued shut to handle his weight. While these are always packaged and sold individually, it's been the norm that you'd probably not buy one without the other. 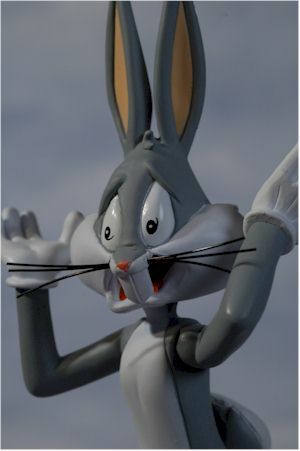 With wave 1, the Sylvester, Daffy, Bugs and Elmer were all so episode specific, that it really didn't make much sense to have one without his corresponding partner. Likewise, Baseball Bugs and Gashouse Gorilla really needed to be together. The only set so far that I could see a lot of single purchases of one or the other character was Road Runner/Coyote pair, where fans of one character or the other might only pick up their favorite. Even then, most folks would really want the pair. The same holds true with the Big House Bugs and Sam set. These are sculpted to look just like their counterparts from that episode, and in to that end they succeed extremely well. However, the arms, hands and poses are sculpted to be very specific, so it's unlikely someone would buy just this Sam for example, especially since this outfit isn't his classic look. 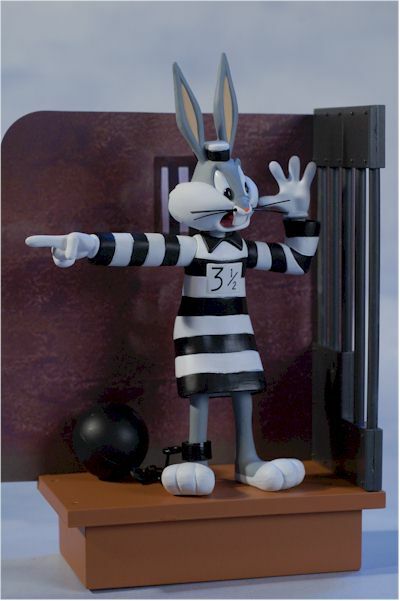 Bugs actually has a metal chain running out to the plastic ball on his leg, and there are several other places where 'real' materials are used, like the string wick on the cannon. The sculpting on the pair is top notch, with as much detail as you can expect from the cartoon style. The proportions are great, and even the scale between them is fairly accurate. Bugs even stands great on his own, always a plus. Of course, Yosemite's feet are way too small to manage that without using the display base. The Water, Water set is really the first pair to break the need for both figures. Oh, I still think a lot of people will buy both figures, simply because they do look terrific together. But this time, there's actually some draw to getting just one or the other. Obviously, everyone loves Gossamer. 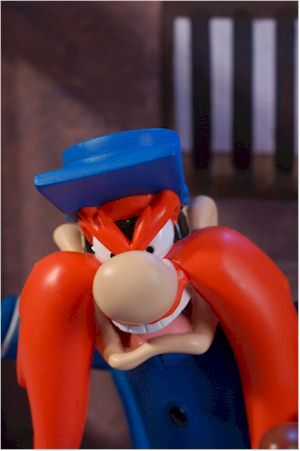 He's a classic character that everyone remembers from their childhood, and with our without Bugs, he looks terrific. He doesn't need the Bugs figure for context - people will recognize him instantly for who he is on his own, and I can see a lot of fans picking him up by himself for their cube at work. While the other Bugs released to this point in the series are all very show specific, the Water version isn't. He's a standard classic Bugs, done in a fairly basic and straight forward pose. 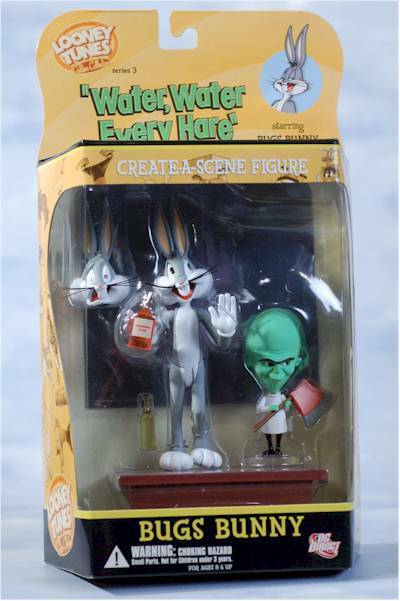 With the regular head (and even the scared version), he gives you a classic Bugs for your shelf, someone you can mix and match in with other classic characters to come. He even stands on his own, despite the sculpted foot pose, and the pre-posed sculpt of the hands and arms actually works with a number of expressions. The paint is actually an improvement this time around. I don't know if I just got lucky, but all four of these look much better than wave 2. Small details are well done, and cuts between colors are fairly clean. Even the difficult white and black stripes on the Big House Bugs are pretty even, with very little bleed between these two tough colors. Coverage is pretty consistent as well, and the work on the eyes and mouths is quite nice. Sam has a glossy appearance to both his eyes and interior of his mouth, which works quite well with the overall appearance. 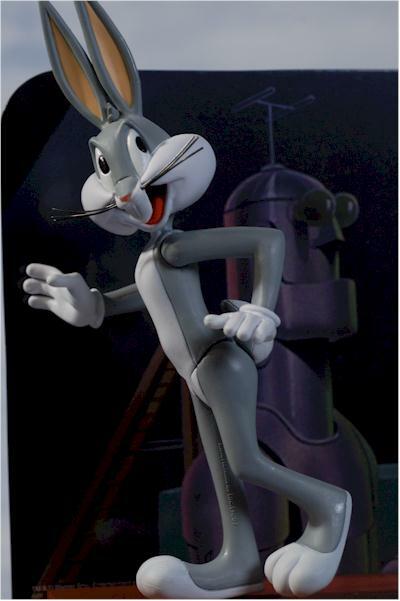 The soft rubber outfits on the Sam and Bugs from the Big House set also match the hard plastic body parts perfectly. Slightly mismatched colors between hard plastic arms and legs and soft torso coverings can often be a problem, largely due to the way the different materials absorb the paint and/or dye, but here it appears they had no issues at all. Without the extra arms, the articulation on these figures is more restrictive to your posing possibilities than it was with wave 2. The Water Bugs has a great ball jointed neck, ball jointed shoulders, cut wrists, and the T type hips we've seen before. Even with the slightly awkward foot pose, you can get him to stand on his own without the base. The hands can be posed in several ways that work with both the normal and scared heads, but he's certainly not as flexible in his poses as the wave 2 Bugs. Big House Bugs has the same amount of articulation, but the sculpted pose with the extended right arm reduces his pose selection even more. Likewise, while Sam has a ball jointed neck, ball jointed shoulders, cut wrist, cut waist and cut hips, there's only a couple real poses he can strike. 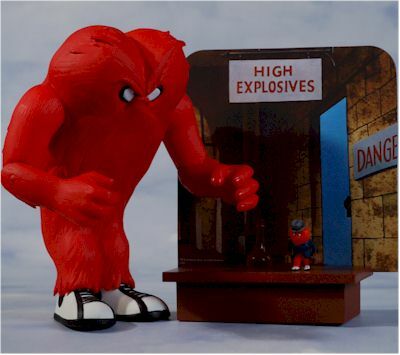 Gossamer is one big hunk of plastic, but he still has ball joint shoulders, pin elbows, and cut legs. He looks good in an attack pose, with the arms at various heights, and he stands absolutely rock solid on his own. Oh, and I almost forgot - both Bugs have articulated tails that can turn at the body. Not particularly useful, but hey, we'll take what we can get. All the figures have a great set of accessories, although this time around there's no extra arms. That's a bit of a disappointment, since it limits the posing and display possibilities, something that was truly extraordinary with wave 2. Water Bugs comes with the usual brown display stand, which can open to hold accessories (and which holds a couple foot pegs already), the cardboard backer (showing the robot on one side, and the interior of the lab on the other), a couple bottles of liquid including the vanishing fluid, an extra scared expression head, and the evil scientist. It's always special to get a whole extra figure as an accessory, so I'm not complaining that Bugs didn't have more arms. 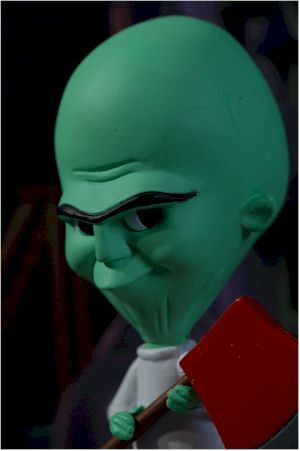 The scientist looks like he just stepped out of the cartoon (the color of his skin is slightly more green in person than in the photos), and he's articulated at the neck and shoulders. He holds the axe perfectly, which is actually another accessory. You can swap in one of the bottles instead if you get his arms in just the right spot, but let's face it - it's the axe he really needs to carry. He stands great with the use of a clear included stand. 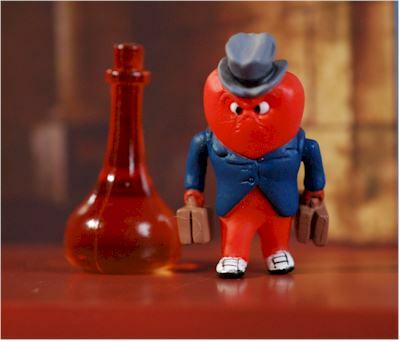 The corresponding figure for this pair, Gossamer, also comes with the brown stand and a backer card. His shows the lab hallway on one side, and the 'monster' door on the other. He also has another flask for the lab display. 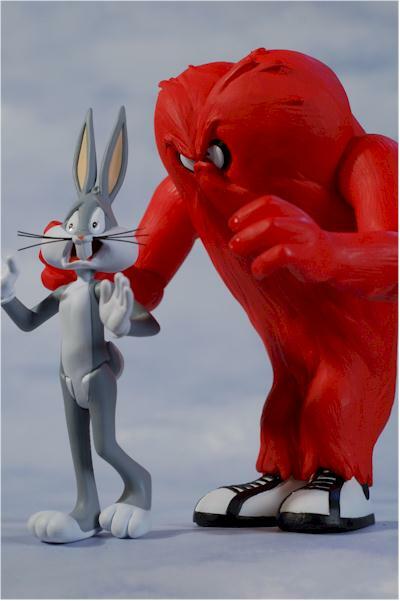 Gossamer is one of those characters though that simply won't fit on his base. He's just too big, but since he has huge feet, and his center of gravity is sculpted perfectly over them, he has no trouble standing on his own without the base. Actually, it's worth noting that the Water Bugs doesn't really require the base either, and you can get him to stand on his own with the feet in just the right spot. Of course, with the base and peg, you'll be able to do a lot more in the posing department. Gossamer has one more accessory which is brilliant - it's his miniature version, after Bugs shrunk him down, all dressed up with his bags huffing out of the lab. Even though he's tiny, posed in a walking stance, and has itty bitty feet, he still stands on his own! Big House Bugs and Sam both come with the same display base, which is slightly more complicated than most past bases. It's the same opening brown bottom, but both have one side of a jail cell attached. They are done as mirror images though, so that put together the cell walls are on opposite sides. That's a nice thoughtful touch that could have easily been forgotten or overlooked. Even better the base has holes on both ends, so you can switch the bars to either side, or put the bars from both sets on a single base! 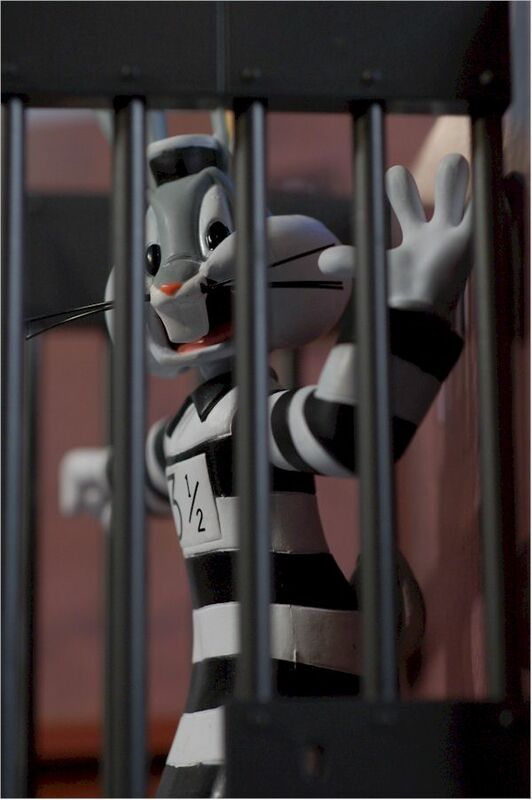 The backer card for Bugs shows the basic cell wall on one side, and the prison yard on the other. Likewise, Sam's shows a cell wall on one side and an exterior shot on the other. Sam also has a cannon with him, a different (and episode specific) cannon than the one that came with Wile E. Bugs has the small silver key, which comes on an actual metal ring. The bases still have the same issue of size that they've always had. They really aren't big enough to work perfectly, but at this price point they're a reasonable solution. They can hold the smaller accessories inside too, which is always nice, but unfortunately the spare Bugs head is just a smidge to big to fit. Just like the previous wave, there's plenty of play potential here. These are also very sturdy toys, and could easily hold up to rough play. On top of that, they're in at least a reasonable price range for a kid's toy, although they won't be selling in the kind of stores that most parents will frequent. That's too bad, because any kid that loves the old WB cartoons would love these. These are a nice above average value, with the level of articulation and the amount of accessories. 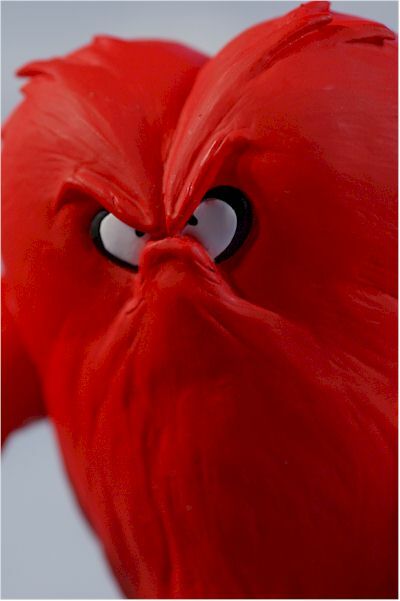 Gossamer is really amazing at this price point, since you could choke a Great White with this guy. If you're picking them out on the shelf, you still want to keep an eye on the paint. While mine were great, you still have to worry about the consistency of the paint work across the series, especially with a specialty market item. Otherwise though, you should be good to go. Wave 2 is still my overall favorite wave, simply because of all the options it provided in terms of accessories and display. But wave 3 is still a home run, especially the Water, Water Everyhare pair. 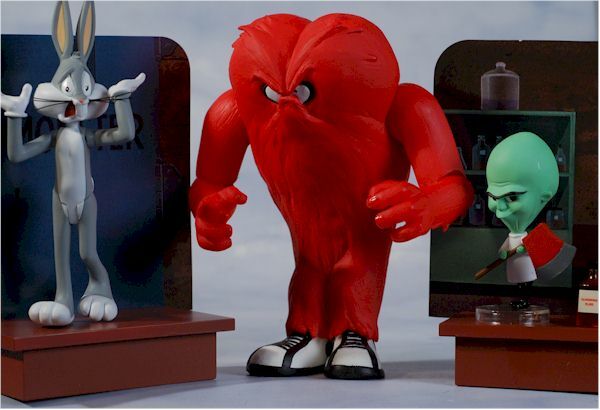 These look great on the shelf, and have actually bumped the first series of Hanna-Barbera figures off my shelf at work. Everyone loves Gossamer! - Alter Ego has an excellent price up for this set, just $40 for all four. They're in stock as well. - CornerStoreComics has the set at $44, or the singles for $12. - Time and Space Toys has the set listed at $45. 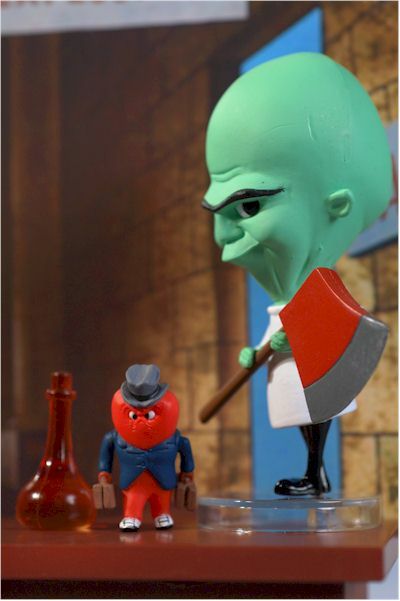 - Amazing Toyz has some of the singles still in stock at $12 each. I reviewed series 1 back when they hit as well, and series 2 was just a few weeks back.